Awwwwww! I think he's pretty cute! Love the hat and shamrock! You did a great job doodling! St. Pat may have dispensed with snakes. 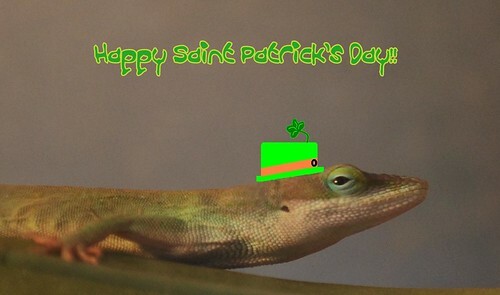 It's nice to know there are a few Irish lizards left. A great hat...it looks real! Perfect! I love it - photo, lizard Evra and hat! Happy St Paddy's day! I don't know why I laughed when I saw the picture, hahaha.